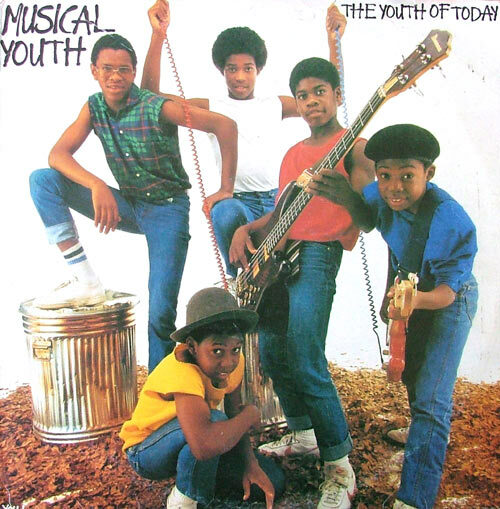 I have nothing but great memories of Musical Youth and I distinctly remember being very excited to hear them played on American radio at exactly the same time that I was becoming totally obsessed with all things ska and reggae (Madness, The Police and UB40 were also getting some American radio play at the time which heartened me to no end). Though my family didn't have MTV, the video for 'Pass The Dutchie' (which was directed by Don Letts and became the first video by a Black musical act to appear on MTV) was bright and fun and it was hard not to like the band who despite their young age were actually playing their own instruments. While most everyone knows 'Pass the Dutchie' (even Homer Simpson referenced it in an episode of The Simpsons) few people have any idea what happened to the British-Jamaican kid group after their 1982 hit—or are aware that they were not just a pop novelty act but actual musicians who played all of their own instruments and wrote some of their own material (namely 'Youth Of Today' which is very catchy). First a very quick bit of history on the band. Musical Youth was founded in Birmingham by two sets of young brothers, Kelvin and Michael Grant and Junior and Patrick Waite. The Waite brother's father, Frederick Waite, was a former member of Jamaican ska and rocksteady group The Techniques (who had several hits in Jamaica) and he sang lead with his son Junior at the start of the group's career in the late 1970s. The band recorded and released a double A-sided 7" single in 1981 with the songs 'Generals/Political' that caught the attention of many UK music insiders for its sound but also because the 35 year old singer was backed by a band of youngsters who were no older than 12 at the time. Have a listen to the song below which was far more political than any of the band's later material. U.S. cable network TVOne recently featured Musical Youth on its excellent musical documentary series 'Unsung' (which is a mix of 'Behind The Music' with bits of 'Bands Reunited' thrown in), and the story that was depicted was far from uplifting. Sadly the band's career was over almost as quickly as it began. With very little actually money for their success ('Pass the Dutchie' reached No. 1 in the U.S. and the U.K. and other countries) reaching their pockets, several members resorted to petty crime and drug abuse. Bassist Patrick Waite died from a heart attack in 1994 while awaiting a court appearance on drug charges; drummer Junior Waite, his brother, is permanently consigned to a psychiatric hospital and guitarist Kelvin Grant is estranged from his brother and Seaton. The Jamaica Gleaner did an excellent profile of the two remaining members of the band Michael Grant (keyboards) and Dennis Seaton (vocals) in conjunction with the airing of the episode on TVOne and its definitely worth a read as is a piece featured in The Guardian in 2003. Below is a long trailer for the 'Unsung' episode as well as a link to watch the entire episode. I highly recommend it. Despite severe trials and tribulations the good news is that the three remaining members of the band are still active musically. Seaton and Michael Grant still perform as Musical Youth (they just performed a show this past February with more planned for later in 2011). Though estranged from his brother and Seaton, Kelvin Grant is also active again musically. Watch a very recent video interview that Seaton and Grant did in conjunction with the TVOne documentary. Finally, as a special treat, below is a 4-track session the band recorded for John Peel right before they hit the big time with their version of 'Pass The Dutchie'. I always thought Jackie Mittoo had a hand in all this, too. Thanks for this Marco! It's good to see people recognise Musical Youth's actual talent, because it's easy to forget or ignore the fact that they actually wrote and composed a lot of their own songs and played their instruments very well. They were ery talented musicians and it's quite sad how the record company politics pretty much killed their musical careers.